Like lots of people, much of my free time nowadays is spent playing through the giant-sized Witcher 3; a game that’s as fun to play as it is pretty to look at. And as my journey as Geralt of Rivia continues down its dark, twisting, rain soaked path, I continue to be amazed at how much this game pushes the envelope in terms of what RPGs can do. Not since Skyrim or Dark Souls 2 have I felt this convinced of an RPG’s raw iconic appeal. Seeing that the Witcher 3 has been met with near universal acclaim and financial success, it should be clear that the consensus is positive. But what, specifically is it that The Witcher 3 does so damn well? To clarify things, here’s a list of five elements I feel that most distinguish The Witcher 3 as a unique and innovative tour de force. The Witcher 3 is chock full of different historical, mythological, and cultural references; of the sort rarely showcased in video games. That being said, the themes and story feel cross-cultural, in a Joseph Campbell ‘The Hero with a Thousand Faces‘ way: Geralt himself is something in between an Arthurian knight belonging to a mystic order, a Shirlock Holmes type sleuth with unique powers of deduction, and a lone Ronin/Samurai on horseback who travels the land to expel evil. The monsters you encounter are likewise drawn and recombined from a litany of different source material, at least from what I can tell. A number of folkloric traditions are included here, and the melding together of so many cultural stories makes for a truly unique environment. Nowhere do we see this evidenced more than in the game’s creature design. From benevolent forest spirits to snarling Deer-Bear demons, these visually compelling creatures are at times bizzare, beautiful, hilarious, and terrifying. You may recognize some and be completely mystified by others; which isn’t to say the game doesn’t also have its fair share of human enemies, as well. Whether your foe be man or beast, each of the enemies you face adds richness and depth to the game’s world. Though Witcher 3 does feature both Elves and Dwarves, they aren’t featured as prominently as they were in Assassin of Kings; a fact that is recompensed in the time you’ll be spending hacking away at Wyverns, Griffons, ghosts, and other unspeakable monstrosities. Considering that elves and dwarves are arguably overused in fantasy culture, this is a positive change for my money. If there’s one thing playing JRPGs taught me as a kid, it’s that you need bold and interesting new enemies and locales for a fantasy world to feel interesting. The Witcher 3, much like Ocarina of Time or Chrono Trigger before it, is fun to explore because of how little you’ll be able to predict what awaits around the corner. And the game’s ridiculous size and story length mean you will continue to discover new content for quite a long time. More importantly, the creatures you encounter in The Witcher 3 are often products of some kind of psychological disturbance or crime against nature. This puts human psychology at the center of these fantastical tales, because it is their capriciousness or ignorance often at the root of whatever evil Geralt ends up vanquishing. The humans and the demons of The Witcher 3 are within a continuum: they don’t just occupy the same world, they are in many respects functions of one another. The demons often work as metaphors for emotional trauma and other facets of human suffering, which lends the game a real complexity few RPGs of this generation even attempt. So other than giving the player glimpses of folktales outside established high fantasy clichés, this folklore-like stylization of real world psychological forces gives the game a unique perspective on human nature as well. Sure, Dragon Age: Inquisition gave us demons named after, and ostensibly incarnations of, human emotions like fear and envy. But that shallow depiction of the spectrum of human shortcomings pales in comparison to the types of woe, misery, backsliding, and contempt you’ll be dealing with along the way in The Witcher 3. So often modern games give us worlds on a massive scale that, despite their considerable size, often feel empty or shell-like. The recent Arkham Knight gave fans an entire Gotham city to explore, but arguably didn’t give them much reason to feel like its Gotham was a living, breathing reality. The Assassin’s Creed games are known for being chock full of things to do, but are also known for featuring towns with little going on outside those tasks to keep players interested. Even in the celebrated Elder Scrolls games, there’s little impetus for players to resist fast travelling around like they’re on a subway once most of the map markers have been found. Contrast this with The Witcher 3, where every square inch of the terrain feels vibrantly overrun with flora and fauna. The wind, the rain, and the sun work together to create the illusion of a real countryside that feels reactive and alive. Even something as ostensibly tedious as driving a boat around never fails to excite, since the scenic visuals are taken as a welcome respite from all the garish monster hunting and questing Geralt invariably gets up to. The scenery in The Witcher 3 is resplendent with attention to detail, which makes me actually feel bad in the rare instances where I fast travel. I feel bad because I know I may have just cheated myself out of discovering a new bandit stronghold, or treasure chest guarded by a dragon. This effect is boosted considerably by turning off the Question mark map indicators. Then, every venture out into the wild holds the possibility of finding something new unexpectedly. The only other game I actually feel bad for fast traveling in is Red Dead Redemption. Not since the adventures of John Marston have I felt so attached to soaking up as much of the game’s environment as possible; or have I felt so sold on the idea of this game’s world being a plausible reality for my imagination to run wild in. Not since then have I felt so immersed in a game’s culture, ecology, and lore. Not to go on and on about this game’s visual flair, but the Witcher 3 really does look incredible. You don’t have to have a GTX Titan or anything to appreciate it, either – even on moderate settings, this game is the first since P.T. to convince me that the jump from PS3 era to now made much difference in graphical quality. Even fifty hours into the game, I find myself marveling at how distinct the skin textures look from the clothing, or how beautiful the cloudy midnight sky looks against the pale moonlight. This might be a difficult thought to articulate, but here it is: everything this game tries to be in its characters, plot, and lore, it also accomplishes with its color palette. Just as the game itself is, the Witcher 3’s visuals are all at once fantastical and dark, escapist and cynically grounded in reality; beautiful and horrifying. That is how you pull off aesthetics in a video game like this: by showing us with color and with textures what would have been so boring to hear described in words alone. I have had to drag myself away from some of the sidequests in the game in order to follow along the main storyline. Imagine that! Contrast that with say, Mass Effect 1: an amazing game that I love to this day, yet I have no problems admitting its sidequests were incredibly slapped together and boring to slog through. Sidequests are often a tricky thing for an RPG – even a great RPG like Mass Effect – to get down. Because the main quest, by design, is usually the most interesting one you’ll likely play. How do you make sidequests that don’t upstage the main event yet also don’t feel like boring, unplayable exercises in tedium or fetch questing? In the Elder Scrolls games, Bethesda tries to remedy this situation by vomiting up as many quests at us as possible. Some of them are more memorable than others, and that ‘crap shoot’ quality to the sidequesting in Skyrim seems by design. But the Witcher 3 takes its sidequests in an entirely different direction, by filling its map with a huge number of quests that rarely feel like the ancillary experiences they really are. After all, Geralt’s main job is to be a Witcher – so it’s only natural to that story element that you encounter a number of monsters needing slaying. But where CD Projekt Red take this idea beyond most triple A RPGs is by making the quests more like those found in Baldur’s Gate – in other words, they often feel as impactful and as dramatic as the main quest itself. It’s amazing that a developer would risk a good number of players skipping over so many well written and amazing questlines, but it just shows how much replay value The Witcher 3 offers. I’d argue this game strives to redefine sidequests in RPGs – away from the World of Warcraft or Skyrim models, and toward a conception of sidequesting that doesn’t have to feel low stakes or like one tedious fetch quest after the other. Though not every quest is perfect, The Witcher 3 offers more than enough interesting side quests to keep you distracted through the entire game. Arguably, fantasy as a genre works best when it illuminates something crucial about real life. As much as I loved Pillars of Eternity – and as much as that game is masterfully written – it was difficult at first to keep up, or even care, about the Galflathans or the people of Dyrwood. It was only once you arrive in Gilded Vale to the sight of a massive tree swarming in bloated, hanging corpses that the game’s stakes began to feel more emotionally charged; to feel worth getting invested in beyond the allure of high fantasy for fantasy’s sake. I’m not saying I have any problem with fantasy plots and characters bereft of political or social import: after all, sometimes it’s better to avoid the risk of being pedantic. It would be hard to derive some sort of message, for example, from the presence of the titular gates in The Elder Scrolls IV: Oblivion. That doesn’t prevent Oblivion from being an amazing game. But even so, it’s no coincidence that the best RPGs often do contain settings and themes in congruence with what we experience in real life. This version of fantasy was arguably popularized by George RR Martin’s A Song of Ice and Fire saga: where the presence of things like magic and monsters does nothing to detract from the idea that – in the words of William Faulkner – the story of all worthwhile fiction is that of the human heart in conflict with itself. In other words, the characters peopling these tales of swords and sorcery in the Witcher 3 feel – as in Martin’s epic series and its HBO adaptation – like real human beings, rather than Tolkien-esque symbols. Without going into spoilers, there are a number of quests that use supernatural elements to tell what are actually near-universal stories of human nature. As mentioned, it’s often greed, jealousy, hatred, and other human failings, that bring the game’s gothic aberrations forth from the void. As such, this is a game that’s just as much about what it’s like to be human as it is about a genetically modified killing machine with a heart of gold. Even the game’s political elements –particularly the game’s depiction of the monolithic, colonializing empire of Nilfgaard – don’t feel shoehorned or heavy handed. Underneath its occasionally campy surface of chesty witches, hunky Witchers, and demonic forces, this is a mature and complex game dealing with mature themes (without feeling heavy handed). In the words of the Bloody Baron, “nothing in this world’s all black and white”. 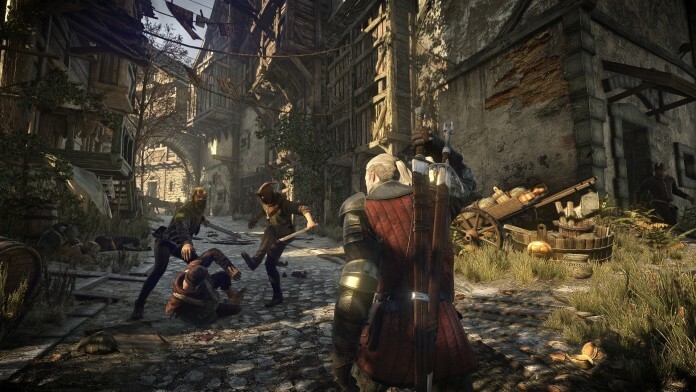 So there you have it – 5 reasons why The Witcher 3 is a landmark RPG, i.e. one of the best in ages. What innovative features did I leave out? Do you think the Witcher 3 is all that great, or am I just overhyping things? Let us know in the comments.